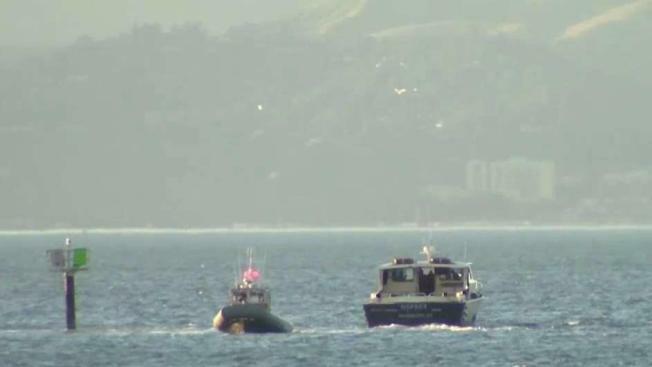 Forty-three people were stranded in San Francisco Bay Saturday afternoon when a ferryboat ran aground on the Berkeley reef, a U.S. Coast Guard lieutenant said. Sergio Quintana reports. Forty-three people were stranded in San Francisco Bay Saturday afternoon when a ferryboat ran aground on the Berkeley reef, a U.S. Coast Guard lieutenant said. Coast Guard officials received a distress call at 2:20 p.m. from the ferryboat Osprey, Coast Guard Lt. Bryan Barr said. The boat ran aground about a half mile from the Berkeley Marina. Barr said two rescue boats rescued 40 people and dropped them off at the Berkeley Marina. The smaller of the two rescue boats was going back to pick up one more person. The last two people on board are crew members and they stayed on board till high tide when they were able to free it from the reef. Once it was clear the Osprey was towed to a repair yard in Richmond. The operator of the tour boat said they simply made a mistake out on the water when they went over the Berkeley reef at low tide. "Right out of the gate the operator made a bad decision as to where he was running the vessel for the day," said boat operator, Taylor Lewis.